We had a really good day benchmarking on Wednesday. We found 2 DNFs, 1 by the USGS and 1 by the NGS plus an FTR (actually all 3 were First To Recover!). All were 1934 or older. 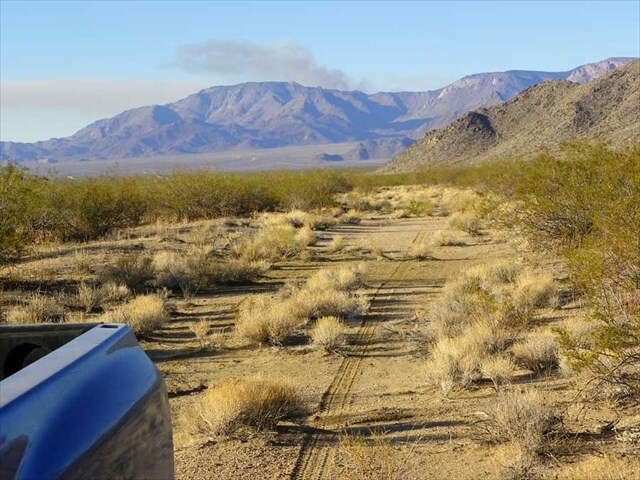 We did a write up for The Online Geocacher "Lost and Found" if you would like to read about the recoveries. Care to tell us about your "good" days benchmarking? (1) Nice work on the recoveries! (2) As usual, beautiful photography! (3) Great blog. Loved the story! You did have a good day. It does not get much better than that. We are jealous and very impressed. 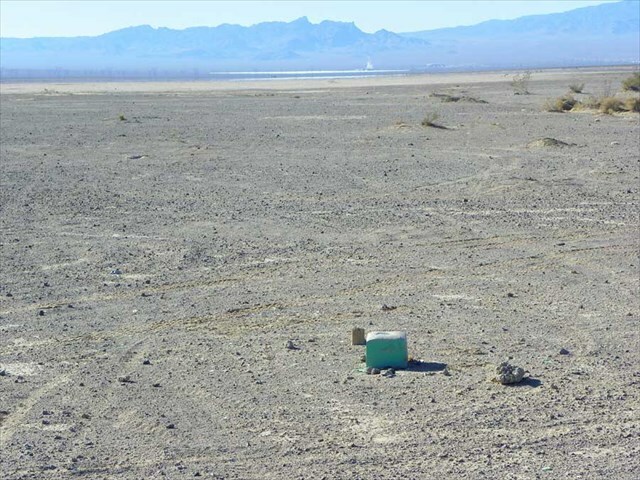 Our most recent goal has been to find a mark that was last not found by the USGS or the NGS. We are still struggling, yet you find both in one day!! Besides giving us hope in our quest, your article also gave us some ideas on finding troublesome marks that can not be found using the NGS datasheets. Thank you both, pgrig and TillaMurphs. I know others have had really good days also. Anyone want to tell about one of them? We would be very interested in hearing about it. What, you mean nobody else has had a good day benchmarking? We would like to hear what YOU think has been a good day benchmarking for you. What day or days stand out in your memory as an exceptional benchmarking experience? Don't feel that you have to have had a day better than some old fart that can hardly get in and out of his truck now-a-days. If you felt it was a good day be sure to tell those folks here that share your pleasure in hunting for benchmarks. We know most friends and co-workers think we are a few bricks shy of a full load when we talk about finding this or that benchmark, so here is the place to share the fun! 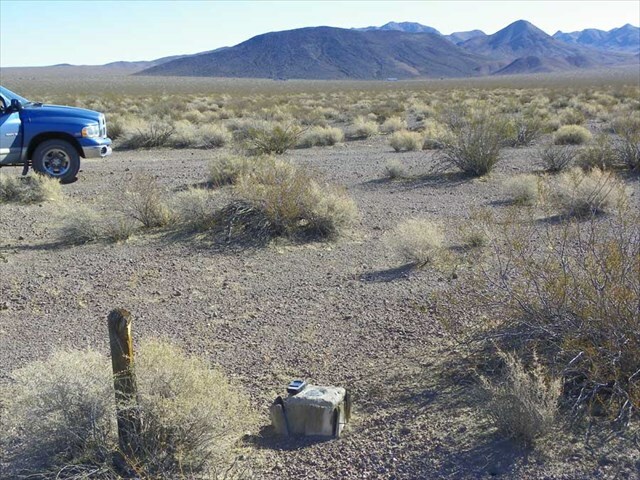 For me, an especially good day benchmarking is finding one that has been previously NOT FOUND, either by myself or another respected geocacher or government agency. I was looking for a good place to share my experience Friday, so thanks for starting this thread. I made an overnight trip, so did some benchmarking Friday evening and Saturday. Friday I was able to recover one that I had visited twice before. RL0789 had no successful recoveries since its 1948 monumentation, but DID have four not found logs dating back to 1988. My first visit was over a year ago, and just a drive-by to scout. As noted in one of the previous logs, there had been road construction. a quick view of the area indicated that if the mark was there, it was likely buried by fill. I logged the second visit, where I paced off the distances and got out the metal detector. 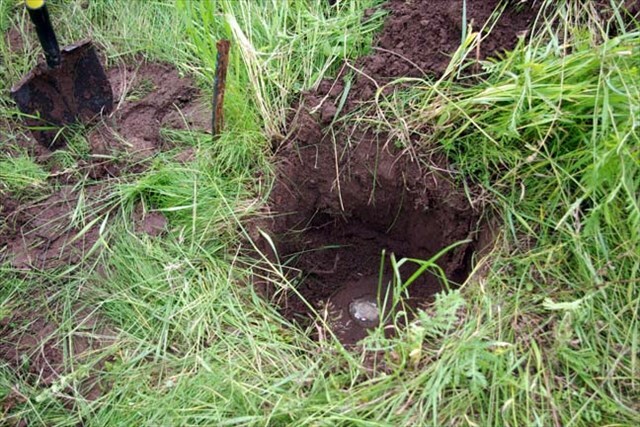 I uncovered the witness post, bent over and buried, but still with its bottom end planted in the earth. However, the data sheet referenced only a wooden witness post, while the one I uncovered was a white metal sign with the post. There was no mention of this in the data sheet, so while I knew I was in the right area, I didn't know for sure where the mark would have been in relation to the post. I dug and probed a bit, but ran out of time. This one is about 2 hours from home, but would have to wait until another visit. I was finally able to get back to this one on Friday. I dug some more in the position indicated by the measurement from the center of the road and found nothing. This position was just *behind* the witness post. Knowing the position of the road may have changed over the years as work was done and it was resurfaced and/or widened, I dug now in the "logical" spot, which was right in *front* of the witness post, as viewed from the road. About 18 inches down, I found it! After smiles and congratulations, I took additional photographs, averaged a GPS reading, and took additional measurements to aid future recovery. 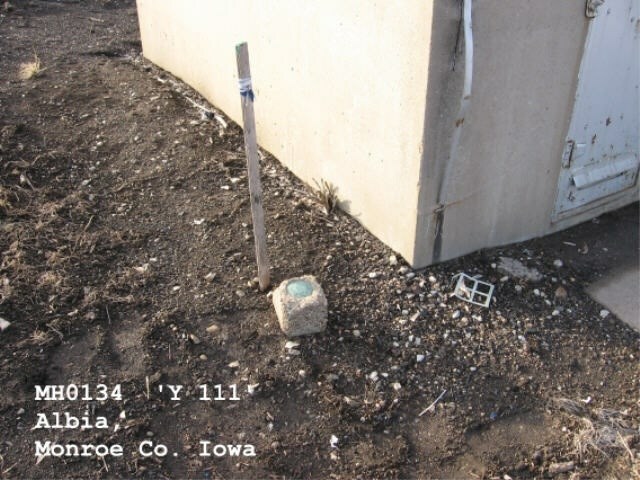 In the photo, you can see what remains of the witness post--maybe about 18 inches above ground. When I found it, it had been pushed over and buried by fill dirt. The white sign had become detached due to rust. EE0054 - 1533 - In an effort to find all the marks along my railroad before I move, this was one of the last up on the north end of the line. The tricky part with this one is is that there's no easy way to get into it. If you drive, you have at least a mile of wooded, trail-less hiking down steep embankments. If you float down the river - well, that's possible, but then getting back up would be a pain. So, the only logical thought was to hitch a ride on a train. (All this work, for a station that will probably never ever be used again because of the difficulties in getting to it.) 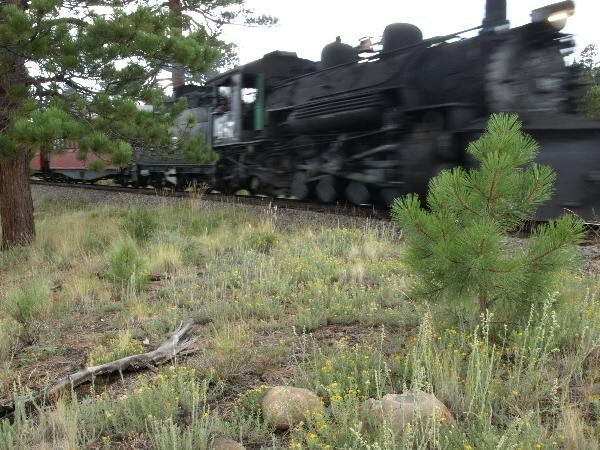 The passenger train was leaving at 11:00, I spoke to the engineer (a friend of mine) and rode with him down to the spot. he slowed down to let me hop off, and I did. I then verified my watch time, because if I missed him coming back, it was a long walk back or a night out under the stars. To my surprise, after measuring everything off, I found the sucker. Oddly, the rock it was mounted in was painted white around the station, something that wasn't mentioned in the Datasheet. I ended up waiting two hours at the station for the return train to take me back to town. I honestly hadn't expected to find that one, nor the next one on my list that will finish off the north end, EE0051 - 1512.. Slowly going down hill. My most recent good day was doing the leveling run to check MH0134 Y 111. I'd never done that much of a leveling project before, and playing with technical toys to a good result made my day. I had found this disk easily in 2005 but hadn't reported because the measurements didn't check and I suspected it had been moved. I discussed the leveling operation in this thread. The elevation checked out beautifully with a mark 0.3 mile away, so I concluded the street had been asymmetrically widened and the RR track raised, and miraculously the building added without destroying the post, and reported the mark as good. In my limited experience - I have to say that anyday benchmarking that takes me someplace I haven't been to (or haven't visited in a looong time) is a good day which so far has been every day (yeay!! ). But for whatever reasons (i haven't tried to figure out) I particularly like marks in rock outcrops, marks in high places and marks that take an effort to get to - and, oh yea, did I mention RR tracks and trestles and bridges? (used to play on them as a kid). One of my first days out I picked a bunch of bench marks that happened to follow a series of interconnecting back-country (county) roads. I found quite a few that day and they were all fairly old (1957) and in parts of the county I hadn't been to with some awesome scenery and views. It was interesting that all the road names had changed but were still there and easily identifiable on current maps from the descriptions and locations on the datasheets I started noticing that the station designations were all similar and when I got home learned about leveling runs and NGS project searches and other such cool stuff. That was a good day. And perhaps the VERY BEST day will be the next one. I will echo billwallace on this one, about every day that I am out benchmarking is a good day. I love being outdoors and going to so many different places to look for benchmarks! Whether it's on the beach in Florida, up in a lighthouse in OH or anywhere else, it's so rewarding to find marks. Naturally, there's a little extra good feeling that comes with finding a mark that's been previously reported as not found. Sometimes digging through a lot of dirt makes the prize that much sweeter(one that I found was 22 inches down). Sometimes you can meet some interesting people as well. Some folks seem quite interested when I explain what I am doing. One time I was invited to a cookout when I sought a tri-station with RMs on a nearby farm! Overall, though, it's just a lot of fun to be out there and looking!! This is a fun thread to read! It was a good day when I finally recovered MY2590, probably because it took me four or five hours stretched out over two years, and gave me the sense that I was (1) learning to use a few new tools (like a metal detector) and (2) getting a little bit better as a benchmark hunter (taking my measurements and reading my compass a little more accurately). We would like to hear what YOU think has been a good day benchmarking for you. What day or days stand out in your memory as an exceptional benchmarking experience? Story of RM2 for RM1843. Checking your log(s), and reviewing the photos for RD0668 confirms my belief that the hero doesn't always have to win to make for a good novel or movie. Thanks AZcachemeister. I just went back to look at the log and realized I accidentally left off a short story about this remote RR station that I came across while researching. A few minutes ago I added the last 3 paragraphs. The last paragraph is especially interesting - things were different back then. It wasn't much of a search, I pulled out my PDA and used Pocket Topo! to find the X and BM that NGS puts on the quadrangles to show benchmarks. Picked the coordinates and walked right to it. Kind of unusual in that it is a brass cap mounted on top of a galvanized pipe, much like Cadastral marks. Then I played out a triple play, a hat trick, if you will by indulging three of my interests in one moment. I combined photography, benchmark hunting and Choo Choo Train chasing in one brief moment. 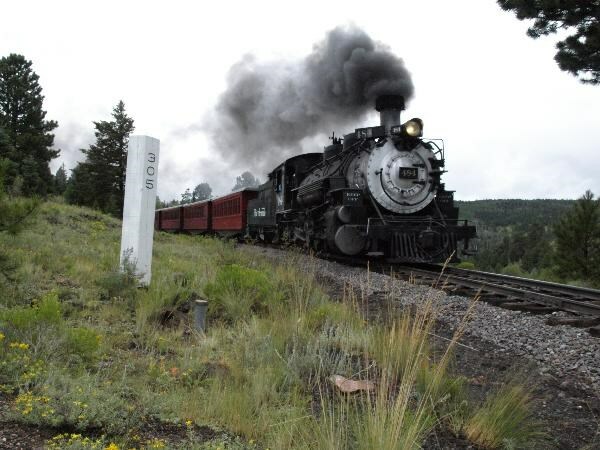 This is the daily westbound tourist train running from Antonito, Colorado to Chama, New Mexico of the Cumbres and Toltec Scenic Rail Road running on the old Denver and Rio Grande tracks. The white post with the number 305 on it is mile marker 305. The Denver and Rio Grande originated in Denver and this spot marks 305 miles from Denver along the old railroad system. I combined photography, benchmark hunting and Choo Choo Train chasing in one brief moment. Great picture! Did you try to find the Supreme Court station, over neat the Antonio side, in the 'S'-curve that weaves between Colorado and New Mexico? I wanted to find that one, but wasn't able to on the last trip due to muddy conditions. Thank you, TillaMurphs and Foxtrot Xray for your nice comments. Being able to add some action to a photo of such a static object as a benchmark was fun. TillaMurphs, I think I would trade a shot of a choo choo for some nice Oregon Coast scenery, any day. I'm envious. That would be quite a find. There's a lot of reasons to visit that area. It's the site of an old section gang house on the RR and from the right angle you can get a view of three levels of RR track. But the road got too rough for my 2WD and I decided that my hunt will involve hiking in. About a one mile level hike by my reckoning. Something for the future. Once again, Thanks for the validation. Yup, that's the one. I have plans to go find it my next trip out there to see my folks.. which means probably next summer sometime. My good day(s) poking along the Canadian border started at the Pigeon River bridge (NE tip of the Minnesota arrowhead) on 13 Aug and ended yesterday when I turned south from the Opheim, Mont border crossing. About 75 IBC station locations were visited as I tried to stop at about every other crossing. A few of the points were triangulation stations south of the border. These have not survived progress very well. The same can be said for most of the early marks set along roadways at less than 50 feet from centerline. I had my laptop map pegged with PID and first date (thanks to Okie'sKid for telling me how to combine two excel columns) and would generally only pull up a data sheet and stop for a quick look if conditions appeared favorable or if I saw a witness post. I had hoped to find at least one obelisk on its original concrete base but every one had been RENEWED within the last 30 years. Several new stainless steel obelisks, with lettering on just the north and south, have been added. Some of these have a PID and some do not. Taking tomorrow off from the hunt to do some map scouting for MORC points SE of Glasgow and get started on NGS recoveries from this trip. Was at Disneyland, and found a new Disney Benchmark, that we (our nationwide group of 5) had not found before! Woo- Hoo!!! OK, I'm easily amused. There are not that many, and we like finding them. It's not listed yet as a Waymark, as it was too dark to get a good quality picture, but it will be. It's about 20 feet SE of the Candyland Canal Boats ride. Yes, Wintertime (on this forum) is one of our little group. I've been a cacher for a few years but just discovered benchmarking in May 2008. It's mostly Canadian Benchmarks that I find because I live in New Brunswick, Canada. On my best day I've probably found about 10 new benchmarks, but it may be easier for me than most because there aren't many benchmarkers in this province and only a handful were found when I started. 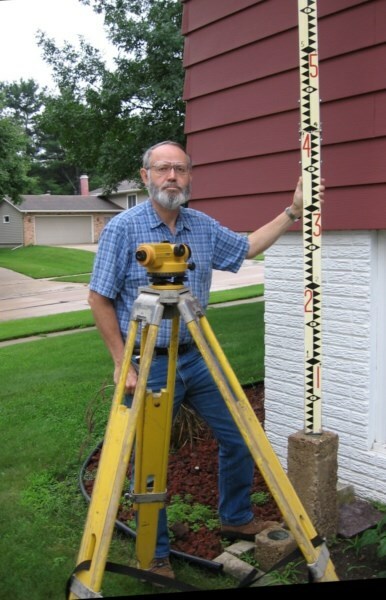 I work for a land surveying company and we've located several in a day just for work. All our finds so far have been new finds. I now leave a metal detector, shovel, camera and, of course, a gps in my car at all times. The gps is loaded with thousands of POI's for various benchmark types all over my province. PS: what do you guys mean by PID? Here in NB it stands for Property IDentifier - a unique number identifying a parcel of land. Uh, the link you provided says Permanent IDentifier. Our latest good day hunting started Sunday and finished up Tuesday, on a mark we've been thinking about for several months, because it presented some challenges of access. It's SY2334, CLARK POT, in Tacoma, WA. When we logged it, we found ourselves preceded on both sites by people who had looked at the site from outside the fence and gone away. As we did, some time back. My latest "good day" benchmarking resulted in no finds at all, but it did result in a sunny day out in the woods with my English Springer Spaniel, Jagger. The coordinates for two of the stations I searched for were out in the nearby lake, but I still looked along the shoreline just in case the coordinates were off. Another mark location was in the middle of a campground which had been obviously regraded since the monumentation date. And a previous log for the last one I searched for said that a local resident had moved the mark, but I thought I should check, anyway. While looking for one mark, I met a park ranger who showed me another mark 3 miles away which looked similar to the ones I was seeking, but it was unstamped and not in the database. I mentioned to him that I might log it on the Waymarking website, but he said that he would appreciate it if I wouldn't, since he has seen so much vandalism of marks in his area. Even though there were no "finds" that day, I had an interesting talk with the park ranger and a great day with my dog. We were in South Tacoma on an errand a couple of days ago, and decided to look for SY0664 STA 20 USAF, which has been logged here several times, and which seemed interesting because its elevation had apparently been changed, some time between its setting and its first recovery (the years for which are switched on the data sheet.) Taping our way to the point, we arrived at a broken stem and some concrete fragments, so we reported the mark destroyed. This morning we thought of comparing our photo of a couple of fragments with an excellent picture of the mark in cachelizard's immediately preceding log, and we found a point of correspondence. We wish the mark hadn't been destroyed, but we felt lucky to land this extra bit of evidence. Incidentally, we doubt that the existence of the broken stem entitles this mark to a "poor" rating, because it is an elevation mark, and the original height cannot be usefully estimated from what remains. Maybe it could in rare cases, for example if the remains were a strong pipe to which a standard disk had been brazed. But on this particular point, elevation matters already seem weird enough. Thank you 2oldfarts for starting this thread. This was a good day for me. The rough bushy terrain prevented me from getting closer than 200 feet to this leaded drill hole two weeks previous. But I recovered from my wounds and came back with a machete and literally whacked my way onto the site. Not much of a triumph to some of you but this mark predates my next oldest mark by 25 years. So, I’m happy. We have tangled with nettles before and it was NOT fun!! Knowing what you're up against does allow one to come prepared for the situation. Very few benchmarkers have found a leaded drill hole, so that puts you into an elite group. Thanks to all who have had good days benchmarking. Found two benchmarks today, one at each end of a bridge, stamped exactly the same. On the NGS datasheets, one is designated 3985.51, and the other is A 3985.51. I wonder why they didn't stamp the A on the disc? Anyway, I almost had a baaad day benchmarking. Dixiedawn, the pictures for CY0435 and CY0436 have a number stamped at the bottom of the disks, which I can't be sure of (10, 18, 19 ?). Was this supposed to distinguish between them and got left off the description? I believe those are supposed to be for the year, the person stamping the disc is supposed to add in the last two digits when set. Many of the AZ Highway Dept discs that I've found don't have them, makes it a little hard to date things. In another area, I was trying to figure out when a particular road was from, but all the discs were like this, just had 19. Our thought about the stampings on these two disks is that both represent the elevation as originally calculated in feet. The data sheet says the heights were adjusted in 1991, and the current heights are a little less than two feet more than the stampings. Interesting that the adjusted heights differ by a single hundredth of a foot. Because the designations are the originally-calculated heights, they left the A off to prevent a kind of confusion that seemed more important than the kind they left behind. Wow. It looks like there are TWO creatures in there. Not sure what the red one is but that does not look like a good place to insert fingers. Yup, two creatures. The smaller black one is probably just some harmless beetle thing. The other one is the one that got me spooked. 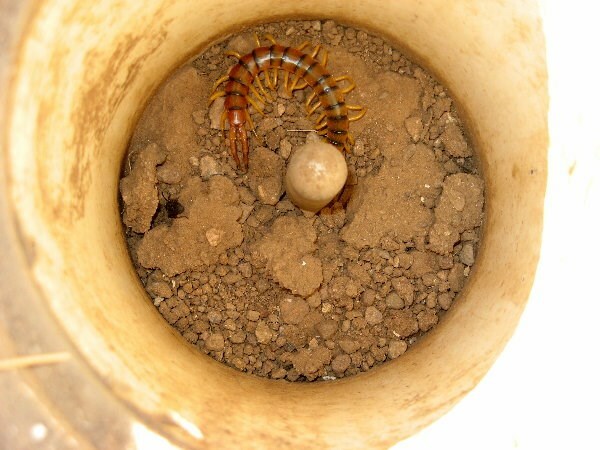 It's a giant centipede. The bite is supposed to be quite painful, but only deadly if you're allergic or very old or very young. I don't know if I'm allergic and don't want to find out the hard way. Interesting that the adjusted heights differ by a single hundredth of a foot. In other words, they did a very good job of building a level bridge ? Seems to me they could have come up with something else to use as a designation - but I guess maybe later surveyors would go by coordinates first and worry about disc stampings later if at all ? Although there is usually a close correlation between a mark's designation and the name stamped on it, there are marks whose stamping does not much resemble the designation. The data sheet provides both, so identification of a mark by what is stamped on it can usually be managed by anyone in possession of the data sheet. Before GPS came along, surveyors looking for the marks used to go pretty much by the written descriptions, and still rely heavily on them. In any case the coordinates for these two marks are scaled, so they may not be all that close. I spent most of the last six weeks in the Missouri River Breaks of eastern Montana hunting benchmarks. Except for a couple of 100 degree days the weather was great, scenery better, and only one morning when the access roads were too wet to travel (if there is more than a heavy dew, you don't turn a wheel in that gumbo and walking can be impossible also). Almost all of the Missouri River Commission monuments (BM's and TRI's, 1885 and 1889) in the areas that I got to were found. Several caps were missing, one post with cap was located on the ground but I managed to find the station stone at a shallow depth (my first solo find of a MORC stone). Also picked up quite a few COE/USE MAP CONTROL POINTS that were set in 1937 to map Fort Peck reservoir. Lots of MOrC's remain for the future. If you go, plan to drive quite a few miles per point - I logged 100 miles on the south side of the river from the UL Bend west to US 191. The area is full of archery hunters during September which privides a bit of security in case of vehicle probems (I travel in a long-wheel base two wheel drive F 150 - a higher clearance, shorter rig might be better, but don't count on 4WD if it rains). I used a combination of the Charles M Russell NWR road map, BLM 1:100000 sheets and National Geographic TOPO on a laptop (the section lines on NG TOPO are a great help). Some roads that are open during the summer on the CMR will be seasonally closed for the hunting season. The longest hike that I took from a parking spot was just over three miles one way- most were under one mile and a few were "DRIVE" stations. Most of the MORC BM's from Three Fotks down do not have PID's, but can be found by applying a correction factor to the original Army L/L. I made my 2000th Geocaching benchmark recovery, in the company of the person responsible for kicking my lazy a** into this activity obsession by providing me a comprehensive .gpx of the marks in Arizona. I'm not exactly sure HOW he did it, but ShadowAce created the .gpx he shared with me without the tools we have today that make it so easy to do this. 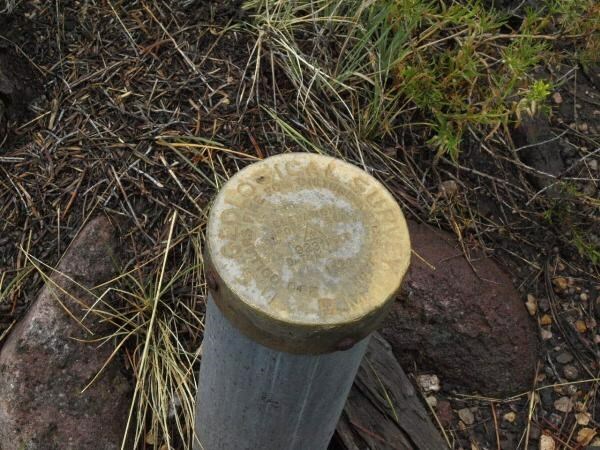 Last Saturday I had the pleasure of finding not only a tri-station and its two reference marks, but also the three associated stone posts which were set by the US Lake Service in 1877. The station itself MC1102 was set flush in a woods, close to its witness post. RM1 projected 4 inches and was close by. RM2 took a tape and shovel to locate. It is flush in a boulder and almost covered by a large tree root. I love to find the older stone posts, since they harken back to an earlier time. Two of the three were in excellent condition, while the third had been almost split in half. It's always good to find a mark whose last log is "Not Found," but it's a thrill to find the older marks as well. Today was a good day for us! All we need to do now is resize the pictures and get the benchmarks logged. Sounds like a great day! Love all of those "older" marks that were still there! I followed a 1935 line along an old RR recently and they were all DNFs except for the one which was "found destroyed" with the post out of the ground. That is a LOT in one day. (In our best day we have never even gotten half that many.) Especially amazing considering that you did it at this time of year with limited daylight. Wow. Congratulations John and Shirley. shorbird, We use Delorme Topo with the small USB GPS plugged into our laptop. Then John downloads the USGS quad maps to the Delorme program so we can have that "X"tra help as we are driving along and I am telling John "go right" or "Veer left" to get to those "X"s.
That is the only way we found some of those old marks this time around. That and our Dodge Hemi with the 4 wheel drive!! 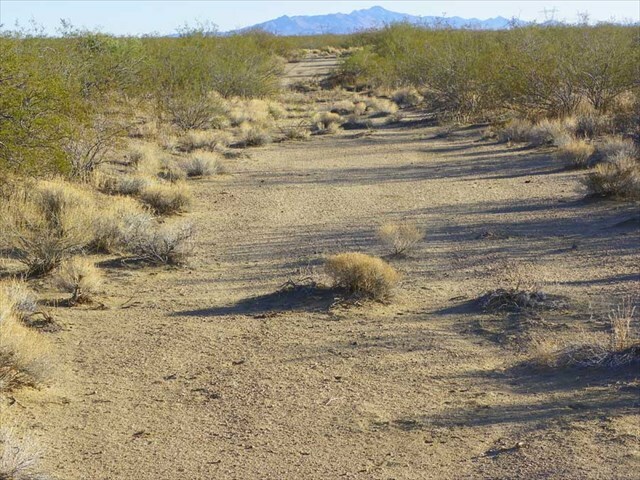 That soft sand and thick desert brush would have been cruel for hiking. Today we picked up another 7 with 6 of them being from 1934\35 era. These we had to cross an old dry lake bed....interesting. John finally got some vacation time. You need the extra time to make a 5 hour drive and spend a couple of nights to be able to get onto a couple of runs of the old ones. We hope everyone has a "Good Day" soon! Here are a few pictures of the roads (?) that we were on during the last few days. Looking east you can almost see the road in front of the truck. Great pictures, 2OF. I want to get out there so bad, that looks fun and isolated. Someone asked.. I too use DeLorme Topo (XMap) and a PN-40. Usually the laptop stays in the passenger seat with the map open so I can do a quick-glance to tell where I'm headed if I'm alone. Otherwise, the navigator will hold the laptop and tell me where to go. USGS Topos all the way, lemme tell you. Yes indeed, nice going oldfarts. You guys sure are an awesome team!. 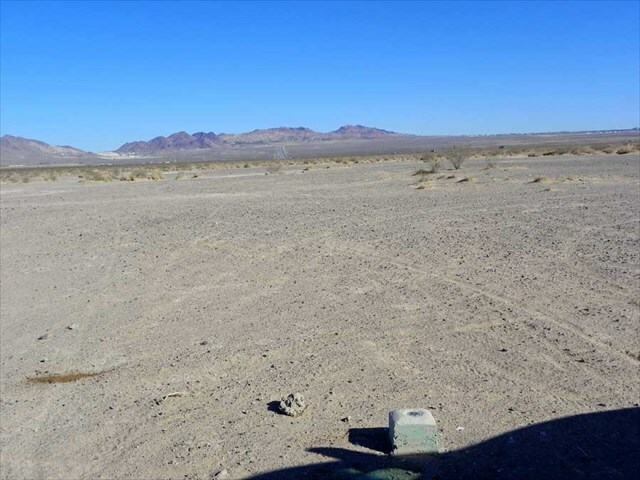 The terrain looks about like the areas we worked together around Laughlin last year, with the turn of the century drill holes. Next time John has some time off, let me know, maybe we can get together again! Another Delorme Topo USA / USGS Quads / PN-40 / 4WD Hemi user here. Can't be beat for benchmark hunting in our part of the country! Sounds good to us. It looks like the next available time off for us will be April 22nd through the 25th (and maybe the 26th). Check your calender and see how that looks for you. Tropicana Express in Laughlin again? If anyone else wants to join in, check your calenders and let us know. There are still several lines of old (1920, 1934 & 1935) ones we haven't gotten to yet, and they haven't been logged on GC yet!